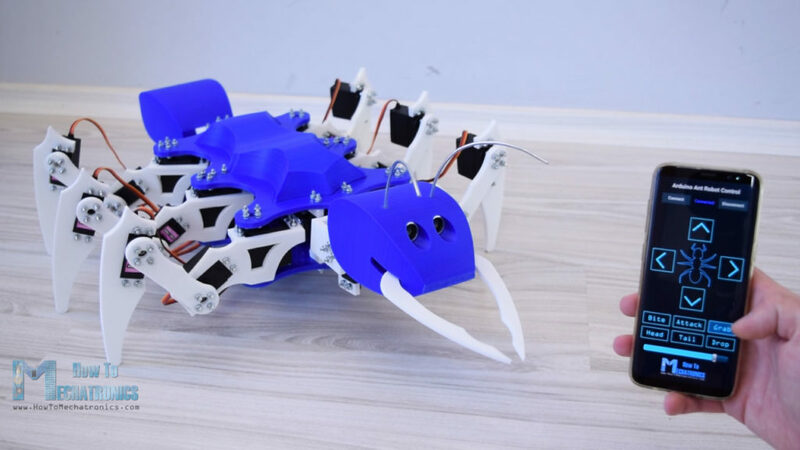 Six-legged robots are nothing new, but if you’d like inspiration for your own, it would be hard to beat this 22 servo-driven, 3D-printed hexapod from Dejan at How To Mechatronics. 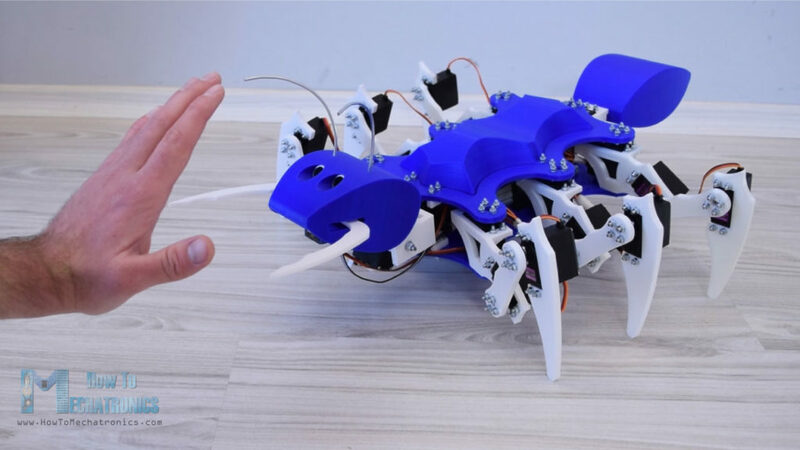 The ant-inspired device features three metal geared servos per leg, as well as a pair to move the heat, another for the tail, and a micro servo to activate the mandibles. To control this large number of servos, Dejan turned to the Arduino Mega, along with a custom Android app and Bluetooth link for the user interface. While most movements are activated by the user, it does have a single ultrasonic sensor buried in its head as “eyes.” This allows it to lean backwards when approached by an unknown object or hand, then strike with its mandibles if the aggressor continues its advance. As the name suggests, the hexapod has six legs but in addition to that, it also has a tail or abdomen, a head, antennas, mandibles and even functional eyes. All of this, makes the hexapod look like an ant, so therefore we can also call it an Arduino Ant Robot. For controlling the robot I made a custom-built Android application. The app has four buttons through which we can command the robot to move forward or backwards, as well as turn left or right. Along with these main functions, the robot can also move its head and tail, as well as it can bite, grab and drop things and even attack. You can see it in action and being assembled in the video below, and build files are available here. I was wondering what the best method to control DYNAMIXEL AX-18A motors from an Intel Edison with arduino expansion board would be, I have teh Arbotix-M, the UartSBee, the Edison with Arduino Expansion Board, and the Arduino Uno. I really want to make it so that I can use the Intel Edison w/ expansion board, and send that to the Arbotix-M. Can you help me? 17 Year-old programs a robot to teach itself to walk!! My name is Gregory, but you can call me Greg. I am a 17 year-old high school student who is building a very interesting robot(I am also doing all of the designing and prototyping. I am building a six-legged robot, called a "hexapod", that is able to teach itself to walk. This hexapod was made almost entirely via 3d printing (translated). The parts that you need to supply include a few fasteners to make connections, twelve servo motors, and a method of driving them. As you can see in the video after the break, all those parts come together into a little robot that functions quite well. The only thing that we think is missing are some grippy feet to help prevent slipping. [Hugo] calls the project Bleuette. It is completely open source, with the cad files and source code available on his Github repository. There is additional information in the wiki page of that repo. This gives us a good look at the electronic design. He’s controlling the legs with an Arduino, but it’s all dependent on his own shield which features a PIC 18F452 to take care of the signals used to drive all of the servo motors. The board also has some peripherals to monitor the current draw and regulate the incoming power. Cant find a tutorial ! Recently I came across some very good hexapods designed with 6,8 and even 12 servos.I have a duemilanove and would like to build one. But unfortunately I have not ventured into this domain and my search for a step by step tutorial on google(on multilegged critters like hexapod) and instructables proved futile.Any Links that can help me get started or rather a complete tutorial link would be awesome.Thanks!